FCPO 3rd month Sept Futures contract rose RM81 higher to close at RM2336 levels as compare to previous trading session with 7,246 lots traded in the market. CPO price surge upwards as soybean oil and crude oil electronic trading were traded higher during the trading session. 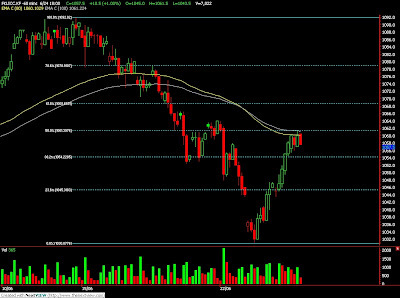 Technically, CPO price manage to surge and temporary stop at RM2333, 50% Fibonacci rebound level. Based on our technical interpretation, we suggestion CPO price would temporary resisted around resistance levels at RM2333 and RM2377 regions. Traders were advice to hold short position during the trading session while be alert around support levels at RM2298 and RM2240 regions. FKLI futures June contract surge 18.5 points higher to close at 1076 as compare to previous trading session with total 9,473 lots traded in the market. FKLI surge up due to mid year window dressing effect despite regional indices were not traded strong during trading session. Technically, FKLI continue to surge after manage to breach previous resistance levels at 1065 and 1070 regions. Based on our technical view, our opinion suggests 1079 and 1094 was our final resistance for correction to remain intact, violation of these resistance levels shall indicates uptrend to take place. 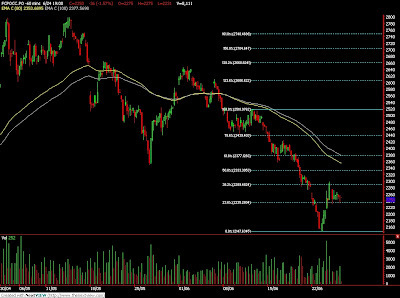 Traders were advice to hold short position in the coming trading session provided resistance levels were not violated while support levels were seen at 1066 and 1057 regions. June 25 (Bloomberg) -- Crude oil was little changed after falling yesterday when a government report showed that U.S. fuel supplies climbed more than forecast as refineries increased operating rates. Gasoline inventories rose 3.87 million barrels to 208.9 million last week, the Department of Energy said. Stockpiles were forecast to increase by 1 million barrels, according to a Bloomberg News survey. Refineries operated at the highest rates this year and fuel demand fell 5.5 percent, the biggest drop since January. Crude oil for August delivery fell 27 cents, or 0.4 percent, to $68.40 a barrel on the New York Mercantile Exchange at 10:34 a.m. in Sydney. Yesterday, the contract dropped 57 cents, or 0.8 percent, to settle at $68.67. Supplies of distillate fuel, a category that includes heating oil and diesel, rose 2.08 million barrels to 152.1 million, the highest since January 1999. A 850,000-barrel gain was forecast, according to the median of 15 analysts surveyed. Diesel stockpiles increased 2.18 million barrels to 111.6 million, the highest since at least 1993. The dollar was at $1.3928 against the euro at 6:02 a.m. in Tokyo following a 1.1 percent advance yesterday. A stronger dollar reduces the appeal of commodities as an alternative investment. Refineries operated at 87.1 percent of capacity in the week ended June 19, up 1.2 percentage points from the previous week and the highest since the week ended Dec. 5, the Energy Department report showed. Fuel consumption slipped 1.05 million barrels a day to 17.9 million last week, the report showed. Gasoline demand declined 225,000 barrels a day, or 2.4 percent, to 9.13 million barrels. Crude oil inventories dropped 3.87 million barrels to 353.9 million, the lowest since March, the report showed. Stockpiles, which have fallen in six of the past seven weeks, are up 17 percent from a year earlier. Gasoline for July delivery dropped 5.07 cents, or 2.7 percent, to end the session at $1.8425 a gallon in New York. It was the lowest settlement since May 22. Eight of the world’s top 10 non-state oil producers, including Exxon Mobil Corp. and Royal Dutch Shell Plc, are vying for the right to help Iraq develop six oilfields and two natural-gas deposits. More than 30 companies in total are bidding for $16 billion worth of technical service contracts for producing fields that will be awarded in Baghdad on June 29-30. The Organization for Economic Cooperation and Development producer is struggling to increase output and revenue from crude sales after six years of conflict and prior sanctions destroyed the country’s economy and infrastructure. China Petrochemical Corp., known as Sinopec Group, will gain reserves in Iraq’s Kurdistan and West Africa upon completing its C$8.3 billion ($7.2 billion) bid for Addax Petroleum Corp.
Brent crude for August settlement declined 26 cents, or 0.4 percent, to $68.07 a barrel on London’s ICE Futures Europe exchange at 10:35 a.m. in Sydney. Yesterday, the contract dropped 0.7 percent to $68.33. June 24 (Bloomberg) -- Gold rose after the Federal Reserve left interest rates at record lows and maintained its policy of buying Treasury securities, boosting demand for precious metals as a store of value. Silver also advanced. The Fed kept its key-rate target at between zero and 0.25 percent after a two-day meeting ended today in Washington. In a policy statement, the central bank said “inflation will remain subdued for some time” and that it still plans to buy as much as $300 billion in Treasuries “by autumn.” Before the Fed issued its statement, gold jumped as much as 2.2 percent today. Gold futures for August delivery rose $7.60, or 0.8 percent from yesterday’s close, to $931.90 an ounce at 5:07 p.m. in electronic trading on the New York Mercantile Exchange’s Comex division. The U.S. Dollar Index, a six-currency gauge of the greenback’s value, climbed as much as 1.1 percent after the Fed issued its statement at about 2:15 p.m.
Gold ended regular Comex trading with a 1.1 percent advance to $934.40, before the Fed meeting concluded. Some investors buy gold as a hedge against inflation. The U.S. consumer price index has fallen 2.7 percent since September, government data show. In London, bullion for immediate delivery was little changed, rising 70 cents to $932.10 an ounce at 10:15 p.m. local time. In London trading earlier today, spot prices gained $5.58, or 0.6 percent, to settle at $931.40 after the Fed released its policy statement. The dollar rose 1.1 percent to settle at $1.393 per euro in New York following the Fed statement and was little changed in early overnight trading. The greenback gained after the Federal Reserve left intact its $1.75 trillion purchase program, which also includes as much as $1.45 trillion in mortgage-related securities and debt. While acknowledging gains in energy and commodity prices recently, “substantial resource slack is likely to dampen cost pressures,” the Fed said in the statement. The benchmark target overnight lending rate between banks is likely to remain at “exceptionally low levels” for an “extended period,” as warranted by economic conditions, the Fed said. Silver futures for July delivery climbed 6.6 cents, or 0.5 percent, to $13.942 an ounce in electronic Comex trading. Silver for immediate delivery was unchanged in late London trading. Earlier, the metal gained 1.5 cents, or 0.1 percent, to settle at $13.865 an ounce on the London spot market. June 25 (Bloomberg) -- The yen fell against the euro and the dollar after a government report today showed Japanese investors bought more overseas stocks and bonds than they sold for a seventh week. Japan’s currency also weakened as an advance in Asian stocks boosted speculation the nation’s employees will use their summer bonuses to purchase higher-yielding assets abroad. Finance companies in Japan are looking to raise 520 billion yen ($5.4 billion) for their mutual funds focused on foreign assets this week, according to data compiled by Bloomberg. The yen declined to 133.99 per euro as of 9:49 a.m. in Tokyo from 133.23 in New York yesterday. Japan’s currency also fell to 95.95 against the dollar from 95.66. The dollar weakened to $1.3966 versus the euro from $1.3930. Japanese investors bought 336.1 billion yen more foreign bonds, stocks and short-term securities than they sold in the week to June 20, according to figures from the Ministry of Finance in Tokyo. The Nikkei 225 Stock Average climbed 1.1 percent and the MSCI Asia-Pacific Index of regional shares rose 0.1 percent. FCPO 3rd month Sept Futures contract fall RM36 higher to close at RM2250 levels as compare to previous trading session with 8,111 lots traded in the market. CPO price traded sideways throughout entire trading session after heavy rebound from previous trading session. 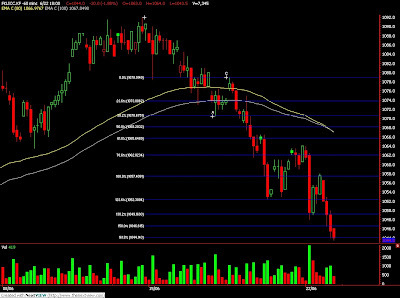 Technically, CPO price seems temporary support above RM2230 support levels at 50% Fibonacci rebound levels. Based on our technical interpretation of CPO price chart, we suggest CPO price might be trading lower in the coming trading session provided resistance levels at 38.1% and 61.8% Fibonacci levels, RM2290 and RM2377 were not violated in the coming trading session. Traders were advice to hold short position in the coming trading session while be cautious around support levels RM2230 and RM2194 regions. FKLI futures June contract surge 10.5 points higher to close at 1057.5 as compare to previous trading session with total 7,022 lots traded in the market. FKLI rebound sharp despite lack of encourage from regional indices and Dow Jones electronic trading. Technically, FKLI seems topped around 50% rebound levels at 1061.5 levels while seems resistance by 80 – day and 100 – day exponential moving in the hourly chart. Based on our technical interpretation, we suggest FKLI would trade lower in the coming trading session provided resistance levels at 1061.5 and 1071 were not violated. Traders were advice to hold short position in the coming trading session while be alert support region near 1054 and 1046 regions. June 24 (Bloomberg) -- Crude oil dropped more than 1 percent after an industry report showed an increase in U.S. gasoline inventories and a small drop in crude stockpiles. Gasoline supplies increased by 3.7 million barrels last week, the industry-funded American Petroleum Institute said yesterday. Oil rose yesterday as the U.S. currency slipped the most in a month against the euro on speculation that the Federal Reserve will temper expectations of an interest-rate increase this year. Crude oil for August delivery fell as much as 78 cents, or 1.1 percent, to $68.46 a barrel and was at $68.69 at 9:54 a.m. Sydney time on the New York Mercantile Exchange. Yesterday, the contract gained $1.74, or 2.6 percent, to settle at $69.24 a barrel. The Energy Department is expected to report that supplies of crude oil dropped 950,000 barrels, according to the median of 14 analyst responses in the Bloomberg News survey. Stockpiles fell 3.87 million barrels in the week ended June 12, the department said last week. Inventories of gasoline and distillate fuel, a category that includes heating oil and diesel, increased, according to the respondents. The department is scheduled to release its weekly report tomorrow at 10:30 a.m. in Washington. “A rise in gasoline inventories and a lower than expected drop in crude supplies will help suppress the price of crude oil,” Mike Sander, an investment adviser with Sander Capital in Seattle said in an e-mail. Gasoline supplies increased to 211.4 million barrels in the week ended June 19, while crude supplies fell 72,000 barrels to 356.6 million, according to the API report. Distillate fuel stockpiles rose 2.3 million barrels to 153.9 million, the reports said. Gasoline for July delivery dropped 2.97 cents, or 1.6 percent, to $1.8635 a gallon at 9:08 a.m. Sydney time. Yesterday, it increased 3.35 cents, or 1.8 percent, to end the session at $1.8932 a gallon in New York. OPEC won’t reduce crude oil production when it meets in September and will ask for more compliance with existing quotas, Kuwaiti Oil Minister Sheikh Ahmed al-Abdullah al-Sabah said in parliament yesterday. The group plans to meet on Sept. 9 in Vienna. OPEC agreed at three meetings last year that the 11 members with production targets would cut output by 4.2 million barrels a day. The dollar traded at $1.4075 per euro as of 6:38 a.m. in Tokyo following yesterday’s drop of as much as 1.75 percent, the most since May 8. Brent crude for August settlement was untraded on London’s ICE Futures Europe exchange early today. It rose $1.82, or 2.7 percent, to end the session at $68.80 a barrel yesterday. June 24 (Bloomberg) -- Gold, little changed in early Asian trading, may rise as a weaker dollar revives demand for the precious metal as an alternative investment. Silver gained. The dollar yesterday dropped as much as 1.8 percent versus the euro, the most since May 8, on speculation the Federal Reserve will today signal it intends to refrain from raising interest rates. Gold typically moves inversely to the dollar. “The more the dollar falls, U.S. consumers will see prices of imports rise and may be prepared to use gold as an inflation hedge,” said Ben Westmore, a minerals and energy economist at National Australia Bank Ltd. in Melbourne. Bullion for immediate delivery traded at $925.54 an ounce at 8:21 a.m. Singapore time. Gold for August delivery were also little changed at $925.70 on the New York Mercantile Exchange’s Comex division. Gold holdings in the SPDR Gold Trust, the biggest exchange- traded fund backed by bullion, were unchanged at 1,131.24 metric tons as of June 23, according to the company’s Web site. Silver for immediate delivery rose 0.4 percent to $13.905 an ounce. Silver has outpaced gold this year, with an ounce of gold now buying about 66.53 ounces of silver, according to data compiled by Bloomberg. That’s down from a high of 84.4 on Oct. 10, which was the most since March 1995. Among other precious metals for immediate delivery, platinum climbed 0.4 percent to $1,166.50 an ounce. Palladium fell 0.5 percent to $235.50 an ounce. June 24 (Bloomberg) -- The dollar traded near a three-week low against the yen on speculation the Federal Reserve will today signal it intends to refrain from raising interest rates this year as policy makers attempt to revive economic growth. The dollar traded at 95.34 yen as of 8:56 a.m. in Tokyo from 95.22 yesterday in New York when it fell to 94.88, the weakest level since June 1. The U.S. currency was at $1.4065 per euro from $1.4077 yesterday, when it dropped 1.5 percent, the most since May 29. Japan’s currency was at 134.13 versus the euro from 134.04. The Fed will probably keep its interest-rate target for overnight loans between banks close to zero and continue its $300 billion program of Treasury purchases, according to a Bloomberg News survey of economists before today’s statement. Rates on U.S. 10-year notes and 30-year mortgages rose to 4 percent and 5.59 percent on June 11, the highest this year. The increases threaten the Fed’s plans to free up lending in credit markets by purchasing debt ranging from government notes to mortgage-backed securities. The dollar will be “biased to weaken” after this week’s Fed policy meeting, according to Credit Suisse Group AG. The dollar also fell to the lowest in more than a week against the euro yesterday as the ECB’s Weber said the scope for interest-rate cuts created by the “dramatic worsening” in the economy and decline in inflation risk has been used up. “The rate differentials will move once again in favor of the euro” as the odds drop for a Fed rate increase this year, said Michael Klawitter, a currency strategist at Dresdner Kleinwort in Frankfurt. The yen weakened earlier after a Japanese report showed exports fell at a faster pace in May. Shipments abroad dropped 40.9 percent from a year ago, compared with April’s 39.1 percent decline, the Finance Ministry said today in Tokyo. FCPO 3rd month Sept Futures contract surge RM129 higher to close at RM2286 levels as compare to previous trading session with 16,754 lots traded in the market. CPO price surge fiercely despite soybean oil and crude oil were closed weak during overnight trading session as they rebound sharply during intraday trading. Technically, CPO price forms a bull engulfing formation in the daily price chart with significant volume increment as signal of trend reversal. Based on our technical analyst, we suggest CPO price would temporary resisted around resistance levels at RM2310 and RM2345 regions. traders were advice to hold long position in the coming trading session provided support levels at RM2170 and RM2212 region were not violated. FKLI futures June contract rebound 3 points higher to close at 1047 as compare to previous trading session with total 7,317 lots traded in the market. FKLI rebound strong after regional indices and Dow Jones electronic trading surge up during the trading session. 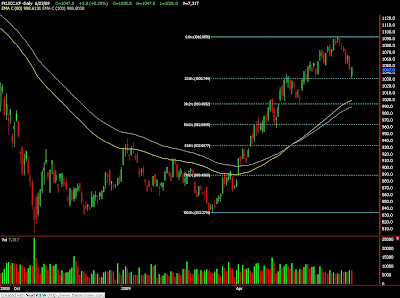 Technically, FKLI seems temporary supported around 23.6% Fibonacci retrace level at 1031 regions. 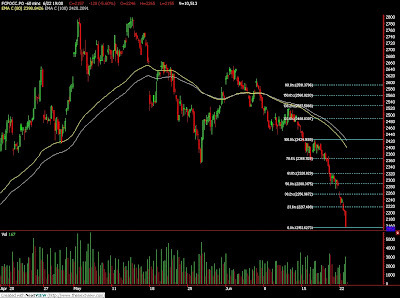 Based on our technical analyst, we suggest FKLI might be bottomed around 1027 and 993 support regions. 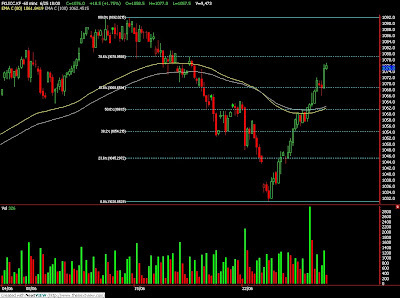 Traders were advice to hold long position provided support level were not violated. Violation of support level shall indicate further downtrend ahead. 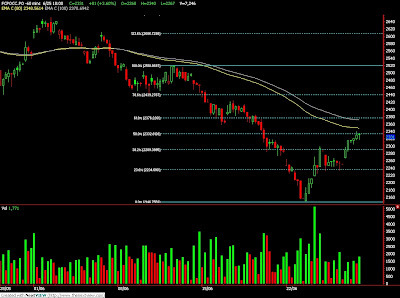 Resistance levels were seen at 1048 and 1058 region. June 23 (Bloomberg) -- Palm oil futures rebounded, paring their biggest drop in more than five months yesterday, as soybean prices climbed and investors deemed four days of declines as excessive. Soybean oil is a substitute for palm oil, and changes in the price can influence trends in the tropical commodity. Chicago soybeans had rebounded from “pretty severe losses,” according to Doug Whitehead, an agricultural commodity strategist at Australia and New Zealand Banking Group Ltd.
Palm oil for September rose as much as 2.6 percent to 2,212 ringgit ($623) a metric ton on the Malaysia Derivatives Exchange, and traded at 2,204 ringgit at 11:40 a.m. The price dropped 5.6 percent yesterday, taking losses over four days to 10 percent. The most-active soybean futures contract in Chicago gained as much as 1.1 percent to $9.9175 a bushel, the first gain in four days. That lifted Chicago soybean oil for December delivery by 0.5 percent to 36.91 cents a pound at 11:40 a.m.
Palm oil can also track crude oil because vegetable oils can be used in biofuels. Prices may be volatile as “we don’t think crude going to $70 and above is justified based on economic fundamentals,” OCBC’s Wong said. “The market is reassessing.” New York crude traded at $66.76 a barrel today. Given the outlook for crude oil and soybeans, “we’re pretty comfortable for the average price between $500 and $550” a ton for palm oil, Wong said. Palm oil has averaged $611 this year, according to Bloomberg data. Palm oil for January delivery fell 1.8 percent to 5,986 yuan ($875) a ton on the Dalian Commodity Exchange in China, the world’s biggest user, at the 11:30 a.m. trading break. June 23 (Bloomberg) -- Crude oil was little changed near $67 after falling on the World Bank’s prediction that the global recession will be deeper than forecast, bolstering concern that fuel consumption will remain depressed. Oil dropped more than $2 a barrel yesterday after the bank projected the world economy will contract 2.9 percent this year, more than its previously forecast decrease of 1.7 percent. Prices also declined as the dollar strengthened, reducing the appeal of commodities as an alternative investment. Crude oil for August delivery was at $67.40 a barrel, down 10 cents, on the New York Mercantile Exchange at 9:03 a.m. in Sydney. Yesterday, the contract fell 3.6 percent to settle at $67.50 a barrel. The July contract expired yesterday. U.S. and European stocks fell on the World Bank forecast, sending the Standard & Poor’s 500 Index down the most in two months. The S&P 500 slid 3.1 percent in New York following last week’s 2.6 percent drop. Gasoline for July delivery declined 6.47 cents, or 3.4 percent, to end the session at $1.8597 a gallon in New York. It was the lowest settlement since May 26. Unrest continued in Tehran over the results of elections in Iran, the Organization of Petroleum Exporting Countries’ second- largest producer. Iran’s Revolutionary Guards said security forces will crush further protests. Oil prices are “satisfactory” for producers and consumers even as global stockpiles remain high, Organization of Petroleum Exporting Countries President Jose Maria Botelho de Vasconcelos said yesterday in Luanda, the Angolan capital. Total U.S. daily fuel demand in the four weeks ended June 12 was down 6 percent from a year earlier, the Energy Department said last week. Gasoline inventories rose 3.39 million barrels to 205 million in the week ended June 12, the biggest increase since January, the department said. Gasoline supplies rose 1 million barrels last week, according to the median of 10 estimates by analysts surveyed by Bloomberg News. The Energy Department is scheduled to release its weekly report on June 24 at 10:30 a.m. in Washington. The dollar advanced after the World Bank report encouraged investors to look for safe assets. The dollar was at $1.3856 per euro at 6:06 a.m. in Tokyo, following a 0.5 percent gain. Declining energy prices sent the Reuters/Jefferies CRB Index of 19 raw materials lower. The index dropped 2.7 percent to 246.07, the lowest level since May 26. Brent crude oil for August settlement dropped $2.21, or 3.2 percent, to end the session at $66.98 a barrel on London’s ICE Futures Europe exchange. June 22 (Bloomberg) -- Gold prices slid to a five-week low after the World Bank forecast a deeper contraction in the global economy this year, curbing the appeal of the metal as a hedge against inflation. Silver also dropped. The U.S. Dollar Index, a gauge of the greenback’s value, against six currencies, rose as much as 0.8 percent after the Washington-based lender said the global recession will be deeper than it forecast in March, fanning demand for dollars as a refuge and curbing inflation worries. Crude oil slid for a second session. Some investors buy gold as an inflation hedge. Gold futures for August delivery slid $15.20, or 1.6 percent, to $921 an ounce on the New York Mercantile Exchange’s Comex division. Earlier, the price touched $918.30, the lowest for a most-active contract since May 19. The metal fell 0.5 percent last week, the third consecutive drop and the longest span of weekly declines since mid-April. Silver futures for July delivery fell 49.7 cents, or 3.5 percent, to $13.703 an ounce on the Comex. Earlier, the price reached $13.68, lowest for a most-active contract since May 18. Silver for immediate delivery slipped 45 cents, or 3.2 percent, to $13.775 an ounce at 8:42 p.m. in London. ETF Securities Ltd.’s silver holdings slipped 0.8 percent to 20 million ounces as of June 19. Gold fell as the strengthening dollar and falling energy prices diminished the metal’s appeal as a store of value. Gold for immediate delivery slid $11.21, or 1.2 percent, to $922.84 an ounce at 8:43 p.m. in London. The metal earlier touched $918.40, the lowest since May 19. “The dollar is stronger, and that is weighing on the metals,” said Alexander Zumpfe, a precious-metals trader at Hanau, Germany-based Heraeus Metallhandels GmbH. Crude oil slid to less than $70 a barrel in New York, which reduced demand for bullion as a hedge, he said. The global economy will shrink 2.9 percent this year, the World Bank said, more than the 1.7 percent contraction it predicted in March. Bullion dropped to $919.25 an ounce in the afternoon “fixing” in London, used by some mining companies to sell their output, from $924 this morning. Gold held by the SPDR Gold Trust, the biggest exchange- traded fund backed by bullion, was unchanged at 1,132.15 metric tons as of June 19, according to the company’s Web site. That’s the longest unchanged span since Nov. 11. Hedge-fund managers and other large speculators decreased their net-long position, or bets prices will rise, in New York gold futures by 7 percent in the week ended June 16, according to U.S. Commodity Futures Trading Commission data. “Further declines could occur in coming weeks, especially if the dollar retains a firm tone,” John Reade, a UBS AG analyst in London, said today in a report. Federal Reserve officials start a two-day policy-setting meeting tomorrow. Reports due this week will update investors on U.S. economic statistics from durable-goods orders to personal income and spending. “If the Fed sounds positive about the economy, the dollar may get stronger, leading to an accelerated slide in gold,” Pradeep Unni, a Richcomm Global Services analyst in Dubai, said today. The Fed cut its target overnight bank-lending rate to 0.25 percent to zero in December, and Chairman Ben S. Bernanke has suggested rates need to remain low to help revive growth. June 23 (Bloomberg) -- The yen strengthened to a three-week high against the euro as Asian stocks slumped, spurring demand for the relative safety of Japan’s currency. The yen advanced against all 16 major currencies before a French report today that economists say will show consumer spending slowed in Europe’s third-largest economy, adding to signs the global recession will be prolonged. Japan’s currency also gained against the dollar before a U.S. report tomorrow that may show durable-goods orders declined in May. The yen advanced to 132.02 per euro as of 9:58 a.m. in Tokyo from 132.93 yesterday in New York. It earlier reached 131.94, the strongest level since May 28. The yen climbed to 95.42 per dollar from 95.87, after rising to 95.29, the highest since June 1. The dollar rose to $1.3838 per euro from $1.3865. The Nikkei 225 Stock Average fell 2.6 percent and the MSCI Asia Pacific Index of regional shares dropped 1.9 percent. The World Bank yesterday predicted the global slump will be deeper than it originally forecast. Growth in French consumer spending slowed to 0.2 percent in May from a 0.7 percent increase in April, according to a Bloomberg News survey of economists before the national statistics office releases the report today in Paris. FCPO 3rd month Sept Futures contract plunge RM128 lower to close at RM2157 levels as compare to previous trading session with 10,513 lots traded in the market. CPO price plunge after soybean oil and crude oil electronic were closed lower during weekend while traded weak during electronic trading. Technically, CPO price continue trade south after manage to breach support levels at RM2263; 38.2% Fibonacci retrace levels. Based on our technical analyst, we suggest CPO price would continue to search lower support around RM2096 and RM1930 regions in the coming trading session. Traders were suggest to hold short position in the coming trading session while be cautious around resistance levels at RM2217 and RM2256 regions. FKLI futures June contract plunge 20 points lower to close at 1044 as compare to previous trading session with total 7,345 lots traded in the market. FKLI plunge during trading session despite regional equity indices and Dow Jones electronic trading stands firm against the selling pressure. 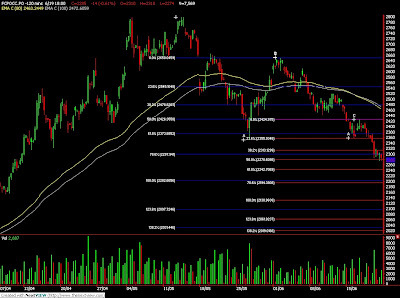 Technically, FKLI seems temporary stopped around support levels at 1044 regions, 161.8% Fibonacci projection figure after manage to rebound 61.8% Fibonacci levels during intraday trading. Based on our wave count, we expect FKLI would continue to trade lower in the coming trading session with support levels seen at 1036 and 1027 regions. Traders were suggest to hold short position in the coming trading session while be cautious around resistance levels at 1048 and 1058 regions. June 22 (Bloomberg) -- The yen gained for the first time in four days versus the euro and the dollar rose on concern Iran’s political situation is deteriorating after a week of clashes between police and protesters, spurring demand for safer assets. The yen climbed versus all 16 major currencies as the number of people killed in Iran increased to at least 17 and security forces detained five members of former President Ali Akbar Hashemi Rafsanjani’s family, adding to signs the divisions in the ruling regime are widening. The Australian and New Zealand dollars fell the most against the greenback and the yen as stocks pared gains, prompting investors to reduce holdings of higher-yielding securities. The yen advanced to 133.44 per euro as of 12:03 p.m. in Tokyo from 134.18 in New York last week, when it gained 0.6 percent. Japan’s currency strengthened to 95.93 per dollar from 96.27. The dollar climbed to $1.3909 per euro from $1.3937. The Nikkei 225 Stock Average pared gains to 0.1 percent from as much as 0.4 percent, and Standard & Poor’s 500 Index futures were little changed. Japan’s currency gained 1.1 percent to 76.79 versus the Australian dollar and climbed 1 percent to 61.25 to the New Zealand dollar as splits within Iran’s ruling elite deepened. Parliament Speaker Ali Larijani yesterday criticized the top election body for siding with President Mahmoud Ahmadinejad and said most Iranians don’t accept Ahmadinejad’s electoral victory. The yen typically strengthens in times of financial turmoil as Japan’s trade surplus makes the currency attractive as it means the nation does not have to rely on overseas lenders. The dollar benefits as it is the world’s reserve currency. The Dollar Index, which tracks the greenback against the currencies of six major U.S. trading partners including the euro, yen and pound, gained 0.2 percent to 80.422. Volatility implied by one-month euro options against the yen rose to 17.5 percent from 17.1 percent on June 19, indicating a greater risk of exchange-rate fluctuations that can erode profit on so-called carry trades. In carry trades, investors get funds in a country with relatively low borrowing costs and invest in another with higher interest rates. The risk is market moves can erase those profits. The benchmark interest rate is 0.1 percent in Japan, compared with 3 percent in Australia and 2.5 percent in New Zealand. Losses in the euro were tempered before a German report that economists said will show business confidence rose to the strongest in seven months, adding to signs the global economy is emerging from recession. The Ifo institute in Munich will say today its business climate index, based on a survey of 7,000 executives, increased to 85 this month from 84.2 in May, according to a Bloomberg News survey, showing signs the recession in Europe’s largest economy is easing. The index fell to a 26-year low of 82.2 in March. The ECB last month kept its benchmark interest rate at a record low of 1 percent. It will offer to lend banks as much money as they want for 12 months in a new auction this week to help get credit flowing again. Analyst forecasts about the dollar have become the most scattered in two years, driving up foreign-exchange price swings and increasing risks that trading strategies and corporate hedges will backfire. Redtower Asset Management, an Aberdeen, Scotland, investment adviser, sees the currency strengthening to $1.16 per Euro by year’s end, from $1.3906 today, as the world economy recovers from the first global recession since World War II. Standard Chartered Plc predicts a more stable economy will weaken the dollar to $1.55 as the Federal Reserve keeps its benchmark interest rate near zero to sustain growth, prompting investors to sell greenbacks for higher-returning assets. The 39-cent gap between the high and low calls in Bloomberg’s strategist survey is almost double August 2007’s 20- cent divide. Wider fluctuations increase the risk for so-called carry trades, where money borrowed from countries with low rates is used to invest for higher yields. A move to unwind such investments probably would drive down the Brazilian real, South African rand and other developing nations’ currencies. June 22 (Bloomberg) -- Crude oil fell for a second day in New York on concern that U.S. gasoline stockpiles will increase because of weak demand during the recession. Oil extended a 2.6 percent loss on June 19 after gains in refinery output amid lower consumption pulled motor fuel futures down by 5.2 percent. Gasoline inventories in the U.S., the world’s biggest oil consumer, climbed a larger-than-expected 3.39 million barrels in the week ended June 12, the Energy Department said last week. Crude oil for July delivery declined as much as 50 cents, or 0.7 percent, to $69.05 a barrel in after-hours electronic trading on the New York Mercantile Exchange. The contract was at $69.44 at 10:33 a.m. Singapore time. The contract, which expires today, closed at $69.55 on June 19, the lowest settlement since June 8. Oil for August delivery, the more-actively traded contract, fell as much as 56 cents, or 0.8 percent, to $69.46 a barrel today. It dropped 2.6 percent to $70.02 on June 19. Last week’s increase in U.S. gasoline inventories to 205 million barrels was the biggest jump since January. Motor fuel demand averaged 9.26 million barrels a day for the four weeks ended June 12, the Energy Department said. That’s down 0.3 percent from the previous year. Total daily fuel demand in the four weeks ended June 12 was down 6 percent from a year earlier, the department said. The so-called crack spread for gasoline, or the profit margin from producing the motor fuel, plunged 19 percent on June 19 and is at $11.66 a barrel today. That’s down from a peak of $16.84 a barrel reached on June 16. Brent crude for August settlement fell as much as 34 cents, or 0.5 percent, to $68.85 a barrel on London’s ICE Futures Europe exchange. It was as $69.17 a barrel at 10:32 a.m. Singapore time. Hedge-fund managers and other large speculators decreased their net-long position in New York crude-oil futures in the week ended June 16, according to U.S. Commodity Futures Trading Commission data. Speculative long positions, or bets prices will rise, outnumbered short positions by 26,430 contracts on the New York Mercantile Exchange, the Washington-based commission said in its Commitments of Traders report. Net-long positions fell by 21,453 contracts, or 45 percent, from a week earlier. June 22 (Bloomberg) -- The yen and the dollar rose against the euro on concern the political situation in Iran is deteriorating following a week of clashes between police and protesters, spurring demand for safer assets. The yen climbed versus all 16 major currencies after the number of people killed in Iran rose to at least 17 and security forces detained five members of former President Ali Akbar Hashemi Rafsanjani’s family, adding to signs the divisions in the ruling regime are widening. The Australian and New Zealand dollars fell the most as Asian stocks reversed gains, prompting investors to sell higher-yielding securities. The yen advanced to 133.36 per euro as of 10:56 a.m. in Tokyo from 134.18 in New York last week, when it gained 0.6 percent. Japan’s currency advanced to 95.90 per dollar from 96.27. The dollar climbed to $1.3905 per euro from $1.3937. The Nikkei 225 Stock Average fell 0.1 percent, after earlier gaining as much as 0.4 percent. The MSCI Asia Pacific Index of regional shares excluding Japan declined 0.3 percent. Japan’s currency strengthened 1.1 percent to 76.76 versus the Australian dollar and climbed 0.8 percent to 61.36 to the New Zealand dollar as splits within Iran’s ruling elite deepened. Parliament Speaker Ali Larijani criticized the top election body for siding with President Mahmoud Ahmadinejad and said most Iranians don’t accept Ahmadinejad’s electoral victory. FKLI futures June contract rebound 9.5 points higher to close at 1064 as compare to previous trading session with total 6,282 lots traded in the market. FKLI rebound tracking closely regional indices and Dow Jones electronic trading rebound fierce during the trading session. 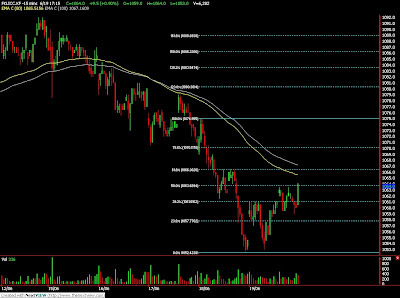 Technically, FKLI seems stopped around 50% Fibonacci rebound levels at 1063.5 regions. Based on our technically analyst, we suggest FKLI still seen riding on the bear rally where resistance levels at 1070.5 and 1079 must not be violated. Traders were advice to hold short position in the coming trading session while be alert around support levels 1059 and 1050 region. FCPO 3rd month Sept Futures contract fall mildly RM14 lower to close at RM2285 levels as compare to previous trading session with 7,569 lots traded in the market. CPO price was traded lower despite soybean oil and crude oil electronic trading surge up during trading session. 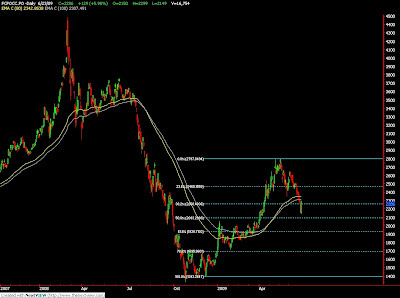 Technically, CPO price traded south to reach target at RM2275 region; 50% Fibonacci projection levels. Based on our technical count, we suggest CPO price still riding on a bear rally but support levels at RM2275 and RM2200 seems holding well against the selling pressure. Traders were advice to hold short position during the trading session while be cautious around resistance levels at RM2300 and RM2354 regions.